CraftGossip.comis an entertaining crafting blog and network that covers all crafts under the sun. I love this blog because there are several posts a day on my favorite subjects like quilting, bath & body, edible crafts, scrapbooking, knitting, stamping, jewelry, and MUCH more. The catchy thing about the site is that each crafting subject has its very own editor. 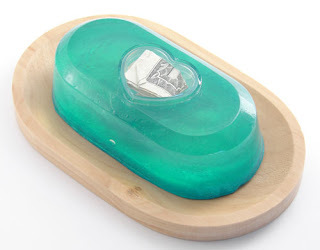 So thanks to the bath and body editor, Jessica Neaves, for posting our Secret Message Soap Tutorial!Read the full tutorial here.